Aufgrund der Internationalität ist folgender Eintrag nur auf Englisch. Bitte um Verständnis! The objective of this incredibly hard game is relatively simple: Locate the picture below on Google Earth using nothing but geological clues. If you don’t like to play or consider Google Earth to be a huge waste of time, just ignore this post. It’s WoGE time! If you don’t have your own geoblog, no problem- just ask a geoblogger to kindly host it for you. 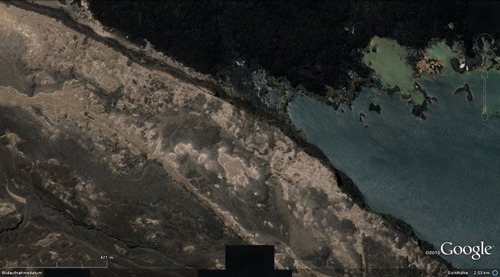 This is part of the Afar Triangle, the only ridge-ridge-ridge triple junction above sea-level, although this particular lake is about 150 m below sea-level in the Afar Depression. As such, this is the lowest dry point in Africa, apparently. According to Wikipedia, the lake is also hypersaline, second only to some lakes in the McMurdo dry valleys, Antarctica (I would never, ever have guessed that). Final interesting titbit: the lake is fed not by run-off but by hot springs, fed in turn by sea-water from the Gulf of Aden. In the viewOle selected, I guess we’re looking at some lava (black) and some country rock (brown), along with part of the lake itself. Absolutely fascinating – I learnt a lot reading about the place. As for finding it, I don’t know how or why but I went straight to it (after freaking out briefly about the lack of a north arrow and the crazy scale). The Afar Triangle was the most darstardly place I could think of. I might have been naughty. I assumed 11:27 UTC meant 1127 hr, as in am, but now I see the other little time-stamp says 00:25, which makes me think it must have been 11:27 as in pm. And I’ve won 3 times before so I was 56 minutes early so now I’m in big trouble with the big WoGE in the sky. Suggestions for ways to repent? I think maybe I just give it back to Ole and promise to keep my mouth shut next time. Sorry everyone. Sniff. @Matt: I don’t think anbody else would have found it that fast. I would suggest to wait until 12:00 UTC if someone else claims the game. If nobody does this, I would suggest that Ole as the host of this game is going to declare you as the winner. @Ole: Wilkommen bei WOGE, damit erhöht sich die Zahl der deutschen Mitspieler auf 4 (wenn meine Kalkulation stimmt, davon 2 derzeit inaktiv). The whole area is just brimming with amazing geology. Next to this picture, you can actually see several vents and mounds. I am still not fully understanding everything that happens there. Woge 265 is all yours! Danke ^^ habe in meinem alten Blog früher mal 2 gelöst, war aber länger nicht mehr aktiv. @Florian: You are right. It’s not easy to catch a WOGE recently as they are solved too fast. Great that you are still with the WOGE game! Hopefully we get the lost “lost Geologist” back, then we would be four. Viele Grüße von BW nach Cottbus.